Shibuya is one of the busiest districts where so many people come for a large variety of purposes. 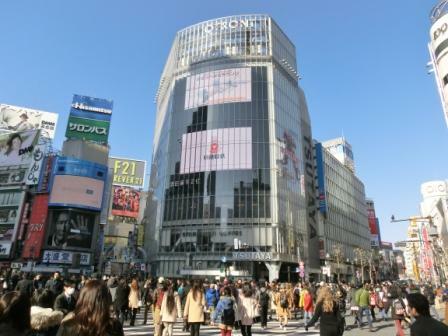 First of all, Shibuya is known as one of the biggest shopping districts in Japan. There are more than 10 massive shopping centers near Shibuya Station. Not only trend-leading fashion, you can find electric devices, pop culture items, souvenirs, musical instruments, art-related goods, etc. It is also a place for gourmets. There are uncountable restaurants and cafes in the streets and buildings. You can choose some from a wide range of them; Japanese local fast food restaurants, worldwide cafes, interesting international cuisine, fashionable cafes, cozy restaurants, etc. As a city of culture, you find some theaters, movie theaters and museums. If you like, there are also nightclubs and live music clubs. 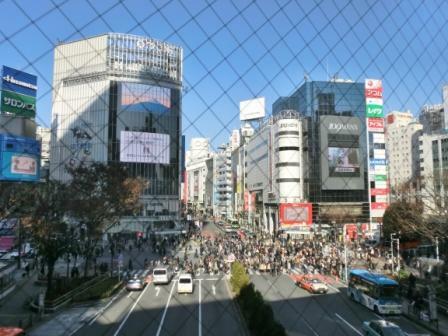 So Shibuya is an exciting district and getting more and more popular among international tourists. Take JR Yamanote Line (via Shinagawa and Shibuya) to Shibuya. Take JR Yamanote Line (via Shibuya and Shinagawa) to Shibuya. Take JR Yamanote Line (via Shibuya and Shinjuku) to Shibuya. Scramble Crossing just in front of Shibuya Station Hachi-ko Exit is busy Shibuya's icon. People are crossing the streets in all directions. The first photo of this article was taken on the ground. There are some good photo spots for Scramble Crossing. 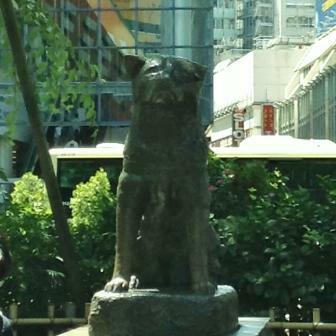 Hachi-ko is a statue of a smart and loyal dog in front of Shibuya Station. His master promised Hachi that he would come back there and entered hospital. Unfortunately, he did not recover from his illness and passed away in the hospital. Hachi believed his words and waited for him every other day. People told Hachi that his master was not in this world anymore, and some felt that Hachi understood it, but he did not stop waiting for him. This old, moving story of love made people to build a statue of Hachi. Today it is loved as a place to meet up friends. 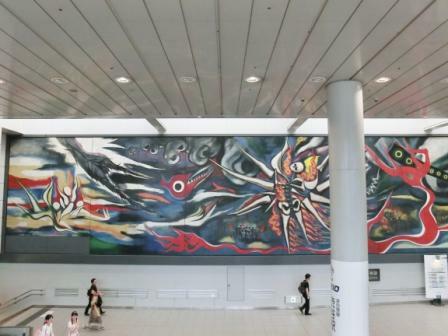 Taro Okamoto (1911 - 1996) is a Japanese leading avant-garde artist and his masterpiece "Myth of Tomorrow" is on the wall of the sidewalk from JR Shibuya Station to Keio Inogashira Line Station. Travel Tip: The photo of Scramble Crossing was taken from this sidewalk. If you don't mind the window, you can see the entire of Scramble Crossing freely. 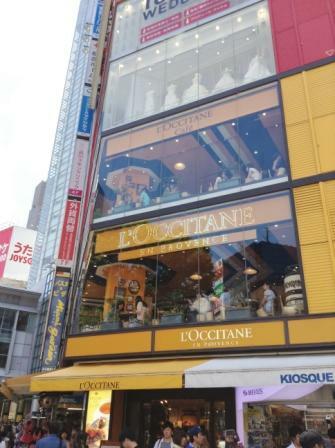 L'Occitane Cafe is one of the most popular cafes in Shibuya. The ground floor is their makeup shop and the 2 higher floors are the cafe. They serve fabulous foods and herbal tea. It is also famous for its views of Scramble Crossing. Sometimes this cafe is a bit crowded, so it is a good choice to avoid lunch time and have a tea break. Details are here. Shibuya 109 is another icon of Shibuya culture. 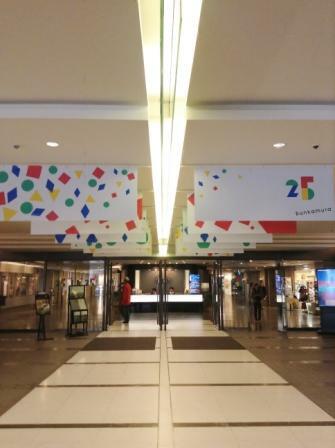 It is a shopping center for young people's fashion. 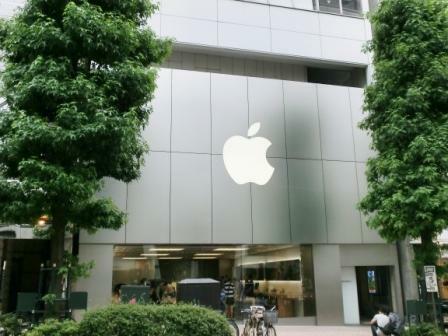 Many popular brands gather in this symbolic building and they have been leading Japanese trends from Shibuya. Opening Hours: 10:00 - 21:00 for Shopping. Some cafes, restaurants and other services open or close one hour early or late. 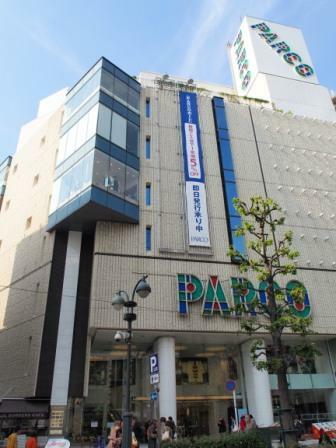 Compared with 109 of Shibuya culture, Parco has a wide range of brands, so it is very popular among young Japanese people. Many are young ladies' apparel shops of various tastes, but others deal with men's cool items. Moreover, there are interesting general stores, cool event spaces, cafes, restaurants and theaters. 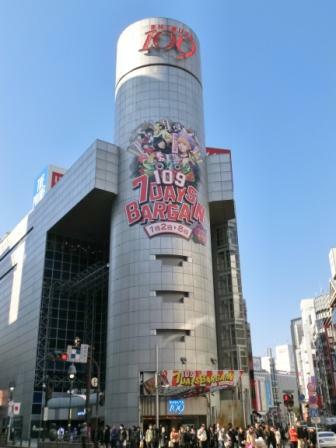 Each of Shibuya Parco Part 1 and Part 3 has 8 to 9 floors with them, so you'll find your favorites that are trendy in this fast growing city of Shibuya. 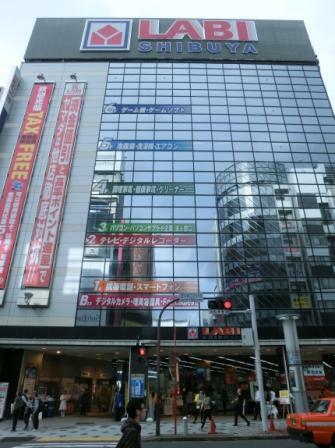 Yamada Denki, a Japanese leading electrical appliance shop, has its big branch in Shibuya. Digital cameras, music players, cell phones, TVs, recorders, computers, cooking appliances, cleaners, air conditioners, washing machines, fridges, video games - You will find anything from more than 500 thousand items. They started to manage tax-free shopping for growing number of international shoppers. If you are a music fan, or you have friends who play the guitar, Kurosawa Music G-CLUB Shibuya is a must-see. 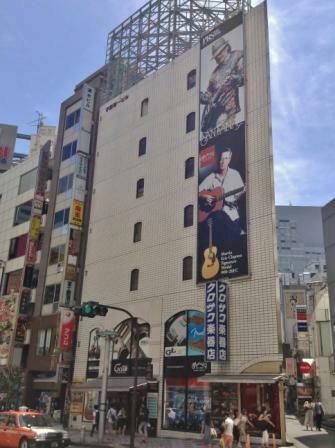 Kurosawa Music Store is an authorized dealer of many leading brands such as Martin, Fender, Gibson, Takamine, and more. This G-CLUB Shibuya specializes in guitars, basses, and ukuleles. Some famous musicians like Eric Clapton have visited this store. Its 7 floors are full of domestic and foreign high-quality musical instruments. The shop clerks and repairers let you try them and deal with tax-free shopping for international buyers. On the ground floor, you find guitar picks and straps of Japan designs. They will be small, cheap and excellent souvenirs. Why don't you drop in at G-CLUB Shibuya? Disney's dream world suddenly appears among all silver buildings in Shibuya. 2 floors are Disney goods shops and the 3rd floor is a ticket counter of Tokyo Disney Land / Sea. 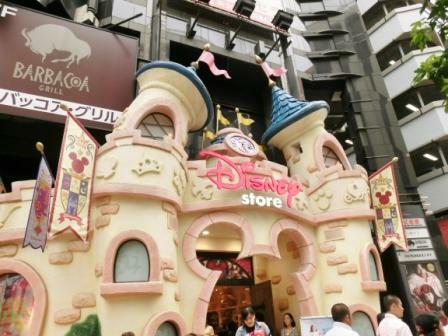 This Disney official store is popular especially among Asian tourists. Tokyu Department Store has its home store in Shibuya. What is notable is Bunkamura. (Bunka means "culture" and Mura does "village.") 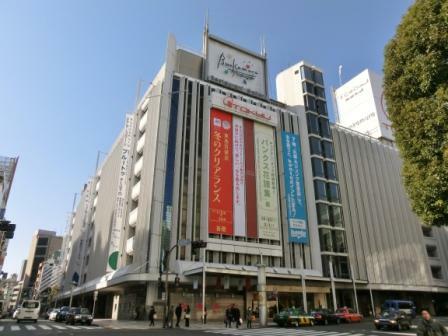 It is Tokyu Group's building of an art museum, concert halls and theaters. They hold classical music concerts, operas, ballets at famous Orchard Hall, art exhibitions at Bunkamura the Museum and plays at Theater Cocoon. Domestic and international famous orchestras, classical singers, dancers and paintings have their performances or exhibitions in Bunkamura. Sometimes some traditional Japanese dances and plays are scheduled at the theater. It is a place for high culture, but not too stiff. It is a fantastic place for art lovers. It is great to take a rest in the good restaurant or to explore culture in theaters in busy Shibuya city. Apple Store is near Parco and Disney Store. They are supporting Apple products such as iPhones. It will be totally endless to refer to all the shopping centers and entertainment places in Shibuya. I am confident for the places I uploaded on this guide, but if you hope to see more choices, 8 more places are here. Shibuya does not have annual, seasonal events, but the streets and shopping centers sometimes hold something exciting especially on weekends. Streets are closed and some performers, marching bands and sometimes stars come. More importantly, not for "official events," Shibuya loving people gather in the streets to share special days. In recent years, Halloween, Japan's matches in Football World Cup and New Year Eve got very popular. These movements are leading Shibuya's culture. Shibuya is one of the hubs in Tokyo, so it is a convenient place to stay. There are some awesome hotels there. Staying in Shibuya is a good choice especially for those who have many places to visit inside Shibuya district or plan to go to Harajuku, Shinjuku and Ikebukuro. It is convenient to visit Asakusa, too, because Shibuya and Asakusa are the terminals of Ginza Subway Line. The following are the other places that I especially recommend to Shibuya visitors. Shinjuku is another busy district in Tokyo. Some of the most luxurious hotels are here and there are also cheap hotels. If you are going to visit Mt. Takao or Mt. Fuji to explore calm and beautiful Japanese nature after exciting shopping, the trains depart from Shinjuku. Shibuya is just 3 stations away from Shinjuku. If you hope to visit Tokyo's bay side area such as Odaiba, old towns such as Ueno and Tsukiji Market, or plan to take Shinkansen Line to Kyoto, Shinagawa is a very convenient place. Shibuya is 4 stations away from Shinagawa. There is Westin Tokyo, a 5-Star hotel of one of worldwide luxury hotel chains, in Yebisu.